Enhance and protect your '03-'06 Chevrolet SSR's Billet Door Handles with these unique Simulated Carbon Fiber Door Handle Decals. Manufactured with our DuraCOLOR Graphics Technology, this three dimensional looking decal set is digitally printed onto automotive grade vinyl material and will enhance the overall look of your ride in minutes! 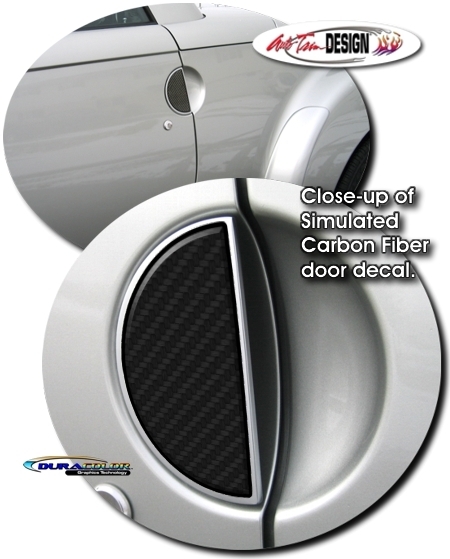 The simulated carbon fiber features a light Black outline and each decal is manufactured so that an approximate 3/16" (.48 cm) of the existing Billet Door handle is exposed, outlining the decal as shown in the image. As an extra step, decal pieces are over-laminated with a 2.5 mil clear laminate which will protect the graphics from miles of abuse. The two (2) piece kit is very easy to install. Includes easy-to-follow general online instructions.